‘Like any fairground ride, Phobiarama is not subtle’: Alice Saville rides Dries Verhoeven’s ghost train at LIFT 2018. I like ghost trains but they don’t work on me. I don’t let them. I can’t stop thinking about who’s behind that door, where the skeleton takes his tea break, whether that light touch on my shoulder was a dangled strip of rubber of a puff of air from a foot pump. They’re fascinating machines of emotional manipulation, built out of the tritest possible ingredients: zombies, axemen, ghouls and headless horsemen. Dries Verhoeven’s interactive theatre ghost train Phobiarama, in London for LIFT after a tour of various international festivals, has a straightforward hook. What if politicians and the media are manipulating our fears like a bunch of particularly charismatic fairground showmen? How are real-life horrors turned into 2D cut-outs, ready to pop up and terrify us into feeling, into voting, a certain way? Like any fairground ride, Phobiarama is not subtle, but it’s full of exhilarating twists and turns. You sit in pairs in a dodgem car that winds round a track in a specially built, dark, circular labyrinth. Screens blare out speeches by the likes of Katie Hopkins, stirring up fear of terrorism and Islamophobia. Then, odd beasts show up in your peripheral vision: men in bear suits, appearing and disappearing in the blink of a strobe light. [They must be hot in those, says my relentlessly pragmatic brain]. 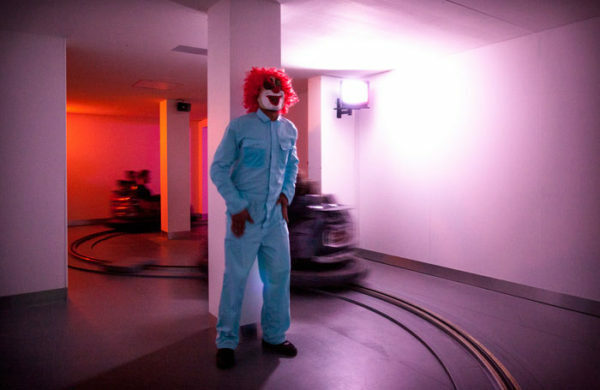 Then, they peel off their furry outer layers to become clowns, chasing the dodgem cars in the show’s most conventionally scary, and for most people thoroughly terrifying, section [I know I’m sick, but clowns genuinely make me smile]. The horror-themed Salomé act continues: they strip to the waist, revealing stacked, solid, tattooed bodies. The fears explored here are initially pretty simple. A zombie embodies our fear of ageing, decaying, getting eaten. A ghost embodies our fear of the dark, of the unknowable, of retribution for crimes we’d rather forget. But when you’re being menaced by a half-naked man, especially a man of colour, things get a bit more complicated. And this is where Verhoeven’s performance has a kind of half-intriguing, half-infuriating incoherence. Do these strong men represent the ‘other’, the migrants who we’re encouraged to fear? Or are they religious far right vigilantes? (Some have large crucifixes dangling from their necks). At one point, they slowly reach into their pockets: in what feels like a reference to news stories where subtle movements that black men make are interpreted by paranoid, racist police as reaching for a gun. They only pull out confetti. But otherwise, for a performance that’s soaked in hate-mongering rhetoric, Phobiarama doesn’t have much political bite. Once you strip these men of their clown suits and reveal their bodies, all these ideas pour out. Women’s rational fear of harassment by men. The irrational, culturally enforced fear of men coded as working class, and even more so of men of colour. How groups of these men do the dirty work that politicians don’t want to: enforcing the borders, policing the streets to their values. And most of all, the Islamophobia that the media-fuelled fear of terrorism relies on, and how it’s attached to the shadowy, figure of a man who’s percieved as other. These strands aren’t explored. And because the performers are silent, and restricted to a set of standardised, ritualised movements, there’s not space within its frame for them to peel back the curtain. This ghost train’s message would be far more chilling if these men were collaborators, rather than performers. As it is, they’re no more than garishly dressed emblems of fears that badly need to be exposed.